Increasing the intake of fruits and vegetables will provide many nutritional and health benefits. It is important to eat a varie­ty of fruits and vegetables because they contain different combinations of fibre, vitamins, minerals and other nutrients. The World Health Organisation (WHO) recommends a minimum intake of five portions of fruits and vegetables daily. This is also known as the five-a-day. However, eating more than the five-a-day recommendation will help you boost your health further. Fruits and vegetables are beneficial for health. Eating a variety of fruits and vege­tables will provide plenty of vitamins and minerals. They are also a good source of fibre and antioxidants (substances that protect the cells of your body from damage). The main nutrients found in vegetables include potassium, dietary fibre, folate (folic acid), vitamin A and vitamin C.
Potassium is important for maintaining blood pressure. Vegetable sources of potassium include sweet potatoes, white potatoes, white beans, tomato products (paste, sauce and juice), beet greens, soybeans, lima beans, spinach, lentils and kidney beans. Dietary fibre from vegetables as part of an overall healthy diet helps reduce cholesterol levels, may lower risk of heart disease and is important for proper bowel function. Commonly found vitamins and fruit and vegetables include vitamins A and C. Vitamin A keeps eyes and skin healthy and helps protect against infections. Vitamin C helps heal cuts and wounds and keeps teeth and gums healthy and aids in iron absorption. Fruits and vegetables are generally low in fat and calories unless they are fried, cooked in a high amount of oil or added to sugar and syrup. Therefore, choosing to eat more fruits and vegetables instead of other foods that are high in fat or have added sugars can help us maintain a healthy weight and thus prevent the risk of overweight and obesity. Eating a variety of fruits and vegetables is also found to prevent some cancers. Experts all around the world agree that fruits and vegetables can prevent disease, improve the quality of life and maintain health and well-being. One portion is equivalent to: one apple/ pear/banana/orange; one glass of 100 per cent fruit juice; one tablespoon of dried fruit; three heaped tablespoons of vegetables; and one cereal bowl of salad. Fresh, frozen, chilled, canned, 100 per cent juice and dried fruits and vegetables are all considered. Fruits and vegetables do not have to be eaten on their own but they can be incorporated into other dishes such as sauces, sandwiches and soups. • Potatoes do not count as vegetables as they are classified as starchy foods. Starchy foods are foods such as bread, pasta and rice. • One glass of 100 per cent juice (pure juice, not made from concentrate) only counts as one portion of fruit and vegetables no matter how much you drink. This is because juice is low in fibre. The juicing process also ‘squashes’ the natural sugars out of the cells that would normally contain them. These can be harmful to the teeth, especially if a lot of juice is drunk between meals. • Dried fruit also counts as only one portion no matter how much you eat. This is because they are lower in certain vitamins, including vitamin C. Dried fruit also contains more sugar than the same weight of non-dried fruit, since the water has been removed. It is for this reason that one must eat smaller amounts of dried fruit than a portion of fresh fruit. Eating large amounts of dried fruit can also be harmful to your teeth. • Beans and pulses also count as one portion from your fruit and vegetable intake. 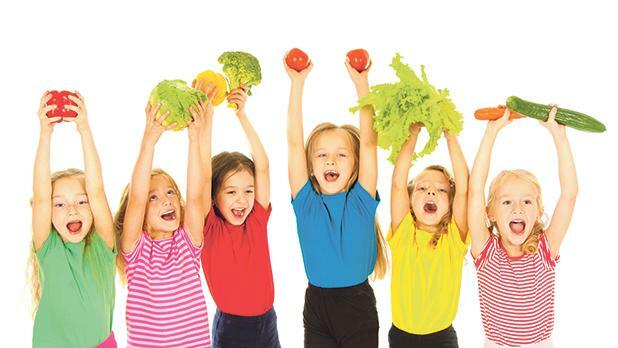 This is because they do not give the same mixture of vitamins, minerals and other nutrients as fruits and vegetables. • Chop up vegetables such as cucumber, sweet pepper, celery, cauliflower and carrots and eat them with your favourite dip. • Blend fruit with natural yoghurt, milk and ice cubes to make a smoothie. This will make a delicious snack. • Add fruit to your cereal at breakfast time. • When preparing meat dishes, make sure there are more vegetables than meat on your plate. • Prepare a fruit salad to take to school, work or even the beach. Blend a variety of fruit, such as bananas, pears, apples, grapes, kiwi and oranges, that could serve as dessert. This is also ideal for elderly people. • Blend vegetables in tomato sauce or in soups to encourage a higher consumption of vegetables especially by children or fussy eaters. • Eating a diversity of colourful fruits and vegetables can be an easy way to get a complete range of the vitamins and minerals your body needs to maintain health.